The most expensive version of the Joint Strike Fighter, the one designed for the US Marine Corps' special needs, has been on "probation" since former Defense Secretary Robert Gates decided last fall that there were too many problems with the plane to justify sticking with it. Friday, the top Marine, Commandant James Amos, said the effort to correct the problems is farther along then expected. 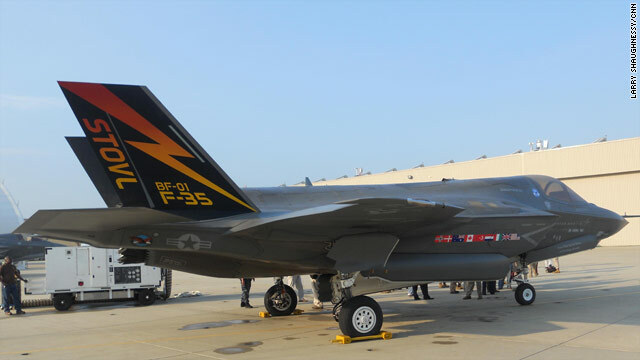 "The metrics for determining how the airplane is flying and testing have improved dramatically, not in every area, but in most areas the airplane is ahead of schedule on tests," Gen. Amos said Friday during a demonstration of the F-35B at Patuxent River Naval Air Station in Maryland. The F-35B, is a the short-takeoff, vertical landing (STOVL) version of the Joint Strike Fighter. It's similar to a Harrier jump jet, but with stealth designed, supersonic speed, and 21st Century electronics that allow the pilot to see all the key information about his plane and the airspace around him either on the eyeshield of his helmet or the giant touch screen on his "dashboard." "I think the unique features of the airplane include the touch panel/touch screen similar to an I-Phone type technology as you work your way through the menus of the airplane, that is different and unique to this aircraft," said Lt. Col. Fred "Tin Man" Schenk, one of the test pilots who flew the F-35B for Friday's demonstration. "There's a lot less switches in the cockpit, the interaction is primarily through that cockpit and screen." It's one of three versions of the F-35 being built for the US military and many of its allies, including Great Britain, Italy and Australia. Most countries want the F-35A variant which takes off and lands on a regular runway like fighters have for decades, or the F-35C carrier variant which is designed to be launched off a modern aircraft carrier with a steam catapult and lands with a tail hook grabbing arresting cables. The F-35B will be able to take off and land on large amphibious assault ships, sometimes called helicopter carriers, without a steam catapult or a tail hook. But those special capabilities comes with a cost. "This airplane is expensive, it is the most expensive variant." Amos said. Great Britain and Italy originally said they wanted F-35Bs for their arsenals. But last fall, in the face of major budget cuts, Great Britain decided not to buy any F-35Bs. With only the US and Italy in the market, that will likely drive the price per plane up even further. But no one knows yet just how much each plane will cost. Amos said his support of the program is strong, but not unconditional. "I'm a realistic cheerleader. I've kinda dubbed myself, because nobody else would dub it for me, so I've dubbed myself as player coach for the F-35 B program." Part of being the F-35B's "player coach" means he keeps track of the program like no other program in the Marine Corps. He has three computer monitors on his desk, one is for unclassified matters, one was turned off when CNN visited but you would be safe to assume it's for classified matters, and a third that tracks nothing but the progress of developing and testing the F-35B. He can track every time one of the planes is test flown. Weight of the STOVL aircraft is crucial and the Marines are making the F-35B as light as possible. He can track changes being made to the plane by Lockheed Martin, the chief contractor, down to less than a pound of weight changes. Currently, he's worried about some hinges on the plane that are stronger than the original design but weight 34 pounds more. But all this effort could be for naught, if the country can't afford to buy the planes. "We're all concerned about the budget. We're all concerned about what's happening financially in our country. There's no question about it. Congress is working day and night. In fact, every time I go home the lights are on at the top of the Capitol. So they're working on this thing," Amos said. The country has to ask some important questions according to Amos. For example; "Is the juice worth the squeeze? That's the question you've got to ask yourself, and we have to have that discussion at the senior level of leadership of our country." When asked if the "juice" of the F-35B is worth the expensive squeeze, Amos replied, "Absolutely." They must have read your postings! Ha! It's about time someone listened. The photo with the article now, is indeed the F-35B. Extremely cool aircraft. Unfortunately we REALLY DO NOT NEED IT. And it is way, way, way more than we can afford. Our local Elementary School has three classes of kindergarteners in a windowless basement. Janesville Wisconsin. Rep. Paul Ryan's hometown. We are closing one school, fired 27 teachers and a whole lot more support staff. Packing the kids into the remaining elementary schools. There are no jobs here. Where is Rep. Paul Ryan? Well, he's on TV somewhere. Ayn Rand didn't care about the common people either. You folks are very correct. That was the Osprey they used to fly the media to Pax River. Confusion reigned somewhere in the path between DC and the internet. I've asked that it be fixed or at least have the photo removed. That is a stock photo of a V-22 Osprey VTOL designed for use by the Marine Corps, not the F-35B VTOL strike fighter. That picture is not of a F-35B.